We left Kearney (pronounced “carney”, which is not helping their case, in my opinion) at about the same time as Rich on Wednesday morning. We passed him before long, but then he called and said he wanted to get a picture of us taking his picture, so we slowed down and waited for him to catch up! He’s having a blast and we’re really happy he could make the trip in something he worked so hard on. 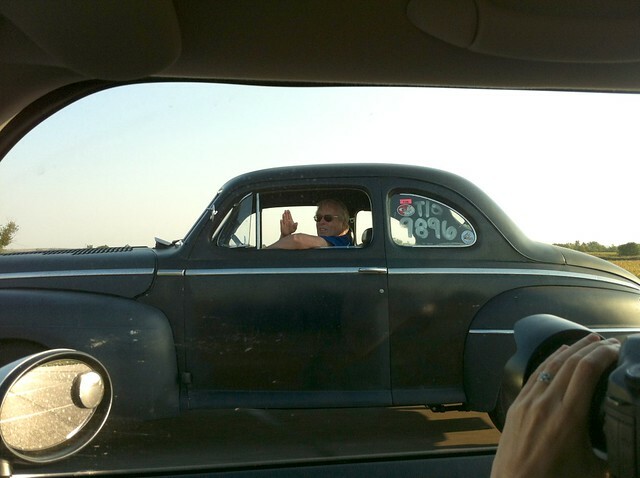 This entry was posted in Photos and tagged Cars, Coupé, Ford, Rich's '47. Bookmark the permalink.